It’s the end of August, the crickets and cicadas are reminding you that, yes, the summer is coming to an end, and for many in the Valley school is just around the corner. For the last two decades and then some, however, there has always been one last hoedown/hootenanny/jamboree (circle one) at Northampton’s Pines Theater, thanks to the efforts of local musicians, technical supporters, food vendors, actors, volunteers and public personalities. I speak, of course, of the annual Transperformance at Look Park, where local artists and groups come together to transform into other well-known stars, based on a yearly theme. The event has been a great success over the years, and has raised hundreds of thousands of dollars for Northampton’s public schools as well as for improvements to the city’s Academy of Music, thanks to the organizational efforts of the Northampton Arts Council and its longtime director Bob Cilman. 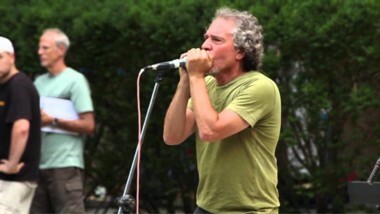 Transperformance is tinged with melancholy this year, as Cilman recently announced his retirement, coinciding with his 60th birthday in June. He plans to spend more time with his other labor of love, the Young@Heart Chorus, of which he is the founder and director, and which in the last decade has toured the world numerous times and been the subject of the multiple award-winning 2007 Fox Searchlight documentary Young@Heart. In honor of his retirement, this year’s Transperformance has been themed “Beyond Bob,” and its lineup has been stocked with local talent performing as artists ranging from Bob Seger (Zip Cody) to Bob Marley (Toussaint the Liberator), Bobby Darin (Eric Olsson) and multiple Bob Dylans. As is customary, the theme gets stretched a bit to allow for some Roberts (Drunk Stuntmen as Robert Plant/Led Zeppelin, Lord Russ as Robert Smith/The Cure) and even some Robertas (Evelyn Harris as Roberta Flack, Heather Maloney as Roberta Anderson aka Joni Mitchell). Personally, I’m planning on downing a few snifters of Harvey’s Bristol Cream before the show and hoping to be enchanted—nay, ensorceled—by Philip Price’s rendition of Robert Goulet. Also inserting themselves between sets, as per tradition, will be random actors, including some who will enthrall the youngsters in the crowd; this year, my money’s on Julie Waggoner as Bob the Builder. Adult comic relief in the Bob-iverse will include Kelsey Flynn as Bob Barker, Johnny Memphis as Bob Newhart, Leo T. Baldwin doing double duty as Robert Burns and Robert DeNiro, and The River’s Monte Belmonte wearing no less than three hats as Bob Ross, Bob Denver and Bob Hope. The annual Transperformance takes place Tues., Aug. 27 from 4 to 9:30 p.m., $3-10, Pines Theater, Look Park, 300 North Main St., Florence, (413) 587-1269, http://www.northamptonartscouncil.org.